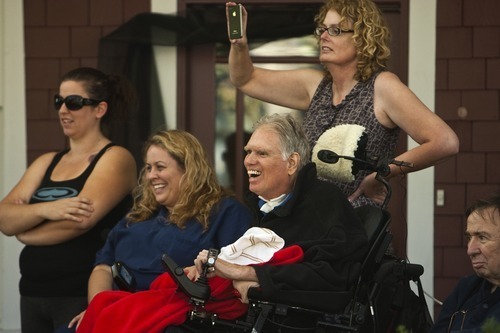 Three years after paralyzing bike crash, retired U. prof continues recovery at home. 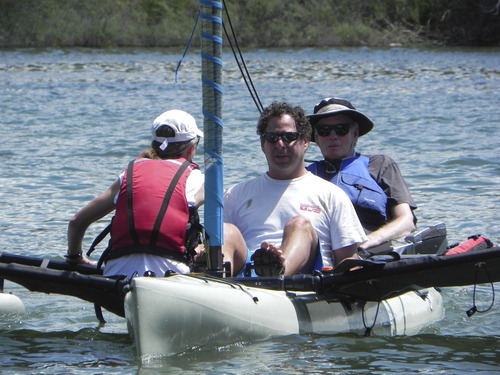 Brooke Hopkins (in the blue vest), paralyzed in a bike accident in 2008, goes sailing with his doctor, Jeffrey Rosenbluth. 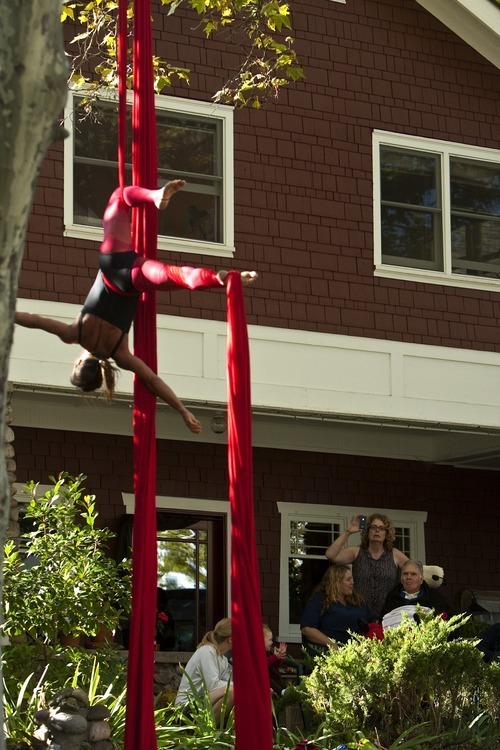 Courtesy Tanja Kari Chris Detrick | The Salt Lake Tribune With family and friends by his side, Brooke Hopkins watches as Aerial Arts of Utah member Deborah Eppstein performs at Hopkins' home in the Avenues Wednesday October 19, 2011. 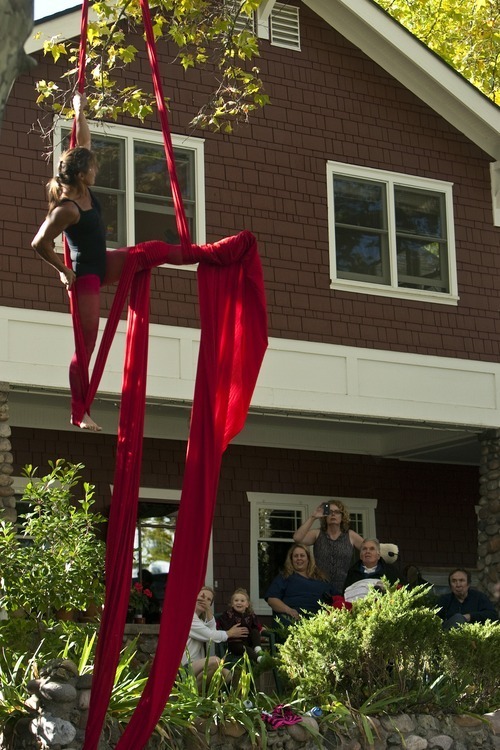 Chris Detrick | The Salt Lake Tribune With family and friends by his side, Brooke Hopkins watches as Aerial Arts of Utah members perform at his home in the Avenues Wednesday October 19, 2011. Chris Detrick | The Salt Lake Tribune With family and friends by his side, Brooke Hopkins watches as Aerial Arts of Utah members perform at his home in the Avenues Wednesday October 19, 2011. 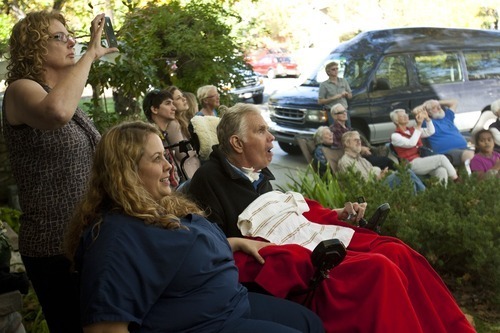 Chris Detrick | The Salt Lake Tribune With family and friends by his side, Brooke Hopkins watches as Aerial Arts of Utah member Deborah Eppstein performs at Hopkins' home in the Avenues Wednesday October 19, 2011. Steve Griffin | The Salt Lake Tribune Mike Erickson, a massage therapist and physical therapist aide, helps Brooke Hopkins, who was paralyzed from a bicycle accident three years ago, into his electric chair during therapy at Neuroworx in South Jordan, Utah Friday, November 11, 2011. 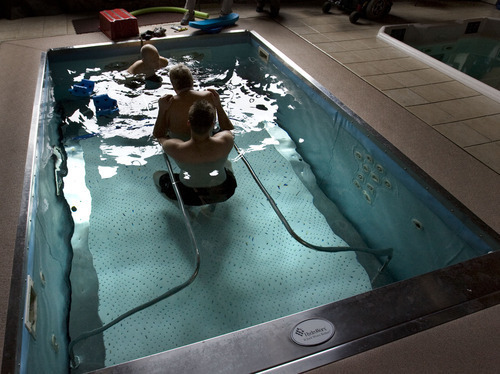 Steve Griffin | The Salt Lake Tribune Brooke Hopkins, who was paralyzed from a bicycle accident three years ago, waits as physical therapist Matt Hansen, left, and LMT/PT Aide Mike Erickson prepare the therapy pool at Neuroworx in South Jordan, Utah Friday, November 11, 2011. 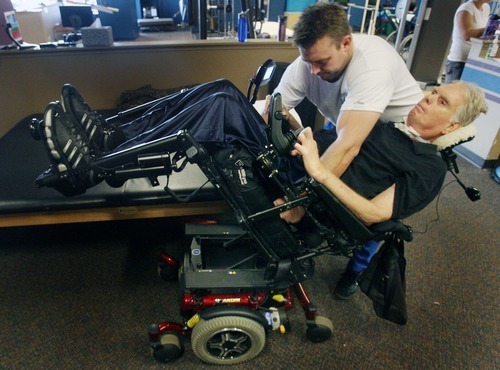 Steve Griffin | The Salt Lake Tribune Brooke Hopkins, who was paralyzed from a bicycle accident three years ago, physical therapist Matt Hansen, left, and LMT/PT Aide Mike Erickson prepare for pool therapy at Neuroworx in South Jordan, Utah Friday, November 11, 2011. Steve Griffin | The Salt Lake Tribune Physical therapist Matt Hansen, left, and LMT/PT Aide Mike Erickson , right, work with Brooke Hopkins, who was paralyzed from a bicycle accident three years ago, during pool therapy at Neuroworx in South Jordan, Utah Friday, November 11, 2011. Steve Griffin | The Salt Lake Tribune Brooke Hopkins, who was paralyzed from a bicycle accident three years ago, struggles to complete an exercise as he works with physical therapist Matt Hansen, left, and LMT/PT Aide Mike Erickson during pool therapy at Neuroworx in South Jordan, Utah Friday, November 11, 2011. 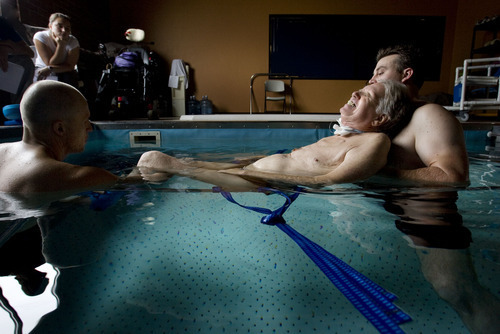 Steve Griffin | The Salt Lake Tribune Brooke Hopkins, who was paralyzed from a bicycle accident three years ago, works with physical therapist Matt Hansen and LMT/PT Aide Mike Erickson during pool therapy at Neuroworx in South Jordan, Utah Friday, November 11, 2011. 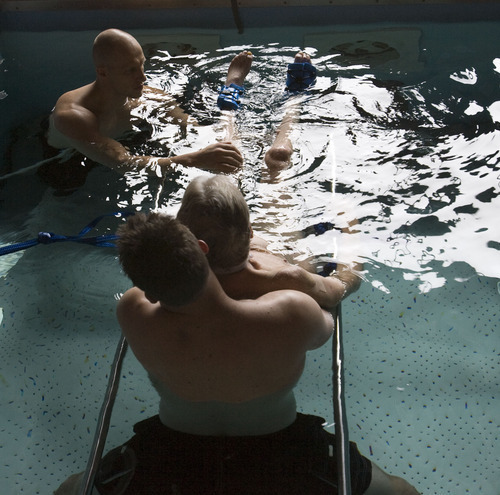 Steve Griffin | The Salt Lake Tribune Brooke Hopkins, who was paralyzed from a bicycle accident three years ago, works with physical therapist Matt Hansen and LMT/PT Aide Mike Erickson during pool therapy at Neuroworx in South Jordan, Utah Friday, November 11, 2011. Steve Griffin | The Salt Lake Tribune Brooke Hopkins, who was paralyzed from a bicycle accident three years ago, struggles to complete an exercise as he works with physical therapist Matt Hansen, left, and LMT/PT Aide Mike Erickson during pool therapy at Neuroworx in South Jordan, Utah Friday, November 11, 2011. Steve Griffin | The Salt Lake Tribune Brooke Hopkins, who was paralyzed from a bicycle accident three years ago, gasps as he stands tall with the help physical therapist Matt Hansen, left, and LMT/PT Aide Mike Erickson during pool therapy at Neuroworx in South Jordan, Utah Friday, November 11, 2011. On a recent Monday, Brooke Hopkins  seated next to his mother's piano and across from the red-and-black wedding tapestry he bought in northern India  engaged a dozen retired professionals in an exploration of Odysseus' homecoming. It was the culmination of Hopkins' continuing-education class on the Greek epic The Odyssey and its mythical hero's two-decades-long adventures and ordeals until he could return to his beloved's arms. The retired University of Utah English professor's own unexpected odyssey began three years ago today  on Nov. 14, 2008  when he collided with another bicyclist while riding in City Creek Canyon and broke his neck. Unlike Odysseus' Penelope, however, Hopkins' beloved, Peggy Battin, has been by his side at every turn. Essentially paralyzed from the neck down, Hopkins spent the first three months at University Hospital, and the next 21 months at South Davis Community Hospital in Bountiful. It took that long to wean him off the ventilator and get him breathing on his own. After seesawing back and forth between hospital and home last fall, Hopkins finally was able to settle into his familiar Avenues abode in the beginning of December 2010. Since then, he has endured a rigorous six-days-a-week program of physical therapy, daily medications and slow, arduous development. Meanwhile, Battin, a nationally recognized medical-ethics expert, has had to juggle the schedule, deal with insurance and medical-supply companies, manage a veritable army of people in the house and maintain her own teaching schedule at the U. "It takes an enormous amount of will not to be bothered by misplaced items and small annoyances," Battin says. "But all the staff is really sensitive to these issues and tries really hard." As a welcome respite, Hopkins has taught classes in his home for one of the U. 's adult-education programs: Henry David Thoreau's Walden, Shakespeare's Winter's Tale, The Iliad, and now The Odyssey, as well as a couple of informal minicourses on the lyrical ballads of Coleridge and Wordsworth and Shakespeare's sonnets. He has ridden in a blue van to the Utah Symphony, to the Oasis Cafe, to friends' houses and to Red Butte Garden. He has "hiked" (via wheelchair) up Millcreek Canyon, sailed on the Great Salt Lake, even journeyed to the new dinosaur museum in Vernal and the Utah Shakespeare Festival in Cedar City. But Hopkins, who will turn 70 in March, also has faced constantly morphing nerve pain and continual adaptation to a restricted life. At times, it has seemed unbearable. He copes, he says, with the help of his wife and his caregivers, a dozen youngish people with an array of medical skills and personal backgrounds whom he would not likely have met without the injury. "There is a great deal of love in the house," Hopkins says. "It is very reciprocal and makes all of us very happy." Frankly, he says, "we're kind of like a family." The highlight of his days, however, is lying on the bed by his wife, talking into the night. Together they have nearly completed a jointly written book about the aftermath of Hopkins' accident, what it has meant personally and how to think about it ethically and emotionally. They call it a "fused voice" effort. Slowly expanding universe • At South Davis, Hopkins was largely stuck in a single hospital room. "A nice space," Hopkins says graciously, "but a very enclosed life." Now he can roam around the first floor of his historic home at will, driving the chair into the kitchen  where he was always the cook  to supervise meal preparation, into the living room to greet friends or out to the deck to watch hummingbirds land on the feeder. "My home is beautiful and quiet," he says. "I love the Avenues and having friends over." It takes, however, all dozen staffers with overlapping shifts in a carefully choreographed program to manage Hopkins' care. He awakes between 6:30 and 7, then two staffers get him out of bed, help with bowel care, lung clearing, bathing and dressing. The whole process takes about an hour and a half. It's the same at bedtime. Two days a week he goes to occupational therapy at the U. to work on upper-body strength, including the ability to use his hands to feed himself or brush his teeth, both of which he can do with assistance. The other days he goes to Neuroworx, a therapeutic facility in South Jordan, for two hours or more of stretching. He does, he says, "endless kinds of exercises to strengthen legs, glutes, hamstrings, feet, lower back, arms and trunk." One day a week, he works out in Neuroworx's pool and another day he is put into a "standing frame" for 45 minutes to put weight on his legs and improve his bone density. All this therapy has produced incremental progress and greater physical strength, which, in turn, have improved his mental and emotional health. As to the possibility of his someday walking, Hopkins and Battin don't even talk about it. "It's always a dance between what is hoped for  which would be full recovery  and what turns out to be possible," Battin says. "That can't be predicted at the beginning yet requires continuous pushing against what seems to be limited." Ironically, though, increased sensations and movement have magnified Hopkins' chronic discomforts. In short, his pain. It is excruciating, for example, to have his lungs suctioned or to sit for long periods in his chair, which pinches the sciatic nerve in his hip and shoots a charge down his right leg. He no longer has an internal thermostat to control his body temperature. "When you get cold, you remain cold for hours and hours and hours," he says. "It is deeply unpleasant." Such constant and immobilizing agonies can "wear you down emotionally," Hopkins says. "But you just live with it." Still, he recently bought a Buddha statue with money his poetry students gave him. And, whether he is looking at it or not, "it creates an aura of equanimity I try to achieve." Embraced by optimism • Despite Hopkins' regular and ongoing pain, he has reasons to hope. Neuroworx is one of only a handful of clinics across the country that specializes in continuous therapy for spinal cord patients. The atmosphere there exudes boundless confidence in progress. "The general notion is that you never, ever, ever give up," Hopkins says. "You always move forward, no matter how high your injury [on the spine]. No matter what anybody tells you, you are always going to improve, even after 10 years." And then there's the joy of teaching. Hopkins has chosen works he has studied and taught throughout his career, but this time it's different. No going back to a particular page. No turning sheets. No underlining. "Now I have them all in my head because I'm listening to them," he says. "I'm underlining in my head." Hopkins' father was a banker, not a literary scholar, but after his retirement, the senior Hopkins taught French history from the medieval period to the Renaissance to a group of his friends. "It's odd," the son says, "how my own life has followed his." And so Hopkins' living-room classes will continue. Next Virgil's Aeneid, he says with delight, then maybe Dante's Inferno and on and on into the future until he can't do it any longer. Brooke Hopkins, a retired University of Utah English professor, was paralyzed in a 2008 bicycle collision. The Salt Lake Tribune has been chronicling his rehabilitation. To see more photos, read past stories and view multimedia presentations, go to http://www.sltrib.com.